This engaging and often moving book collects the letters between two of New Zealand’s greatest writers, supplemented by extracts from published and unpublished memoirs and journals, with some poems, facsimiles of letters and a frontispiece photograph (taken by poet Ruth Dallas) of Frame and Brasch at his cottage in Broad Bay, Otago Peninsula, in 1966. 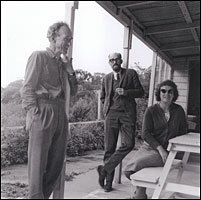 Starting in 1949, when Frame was a shy young writer approaching the august editor of Landfall, and documenting their deepening friendship up to the time of Brasch’s death in 1973, the material has been selected and arranged by Janet Frame’s niece, Pamela Gordon, and Denis Harold, on behalf of the Janet Frame Literary Trust. An earlier version was read with great success at the Auckland Readers’ & Writers’ Week in 2009. The book was designed and letterpress printed by Tara McLeod at The Holloway Press on a Littlejohn cylinder press; the type is 12pt linotype Janson; the paper is Ivory Evergreen 104gsm, and the cloth binding is by Design Bind Ltd. The edition is 150 copies. 61 pages. The price is $NZ250.